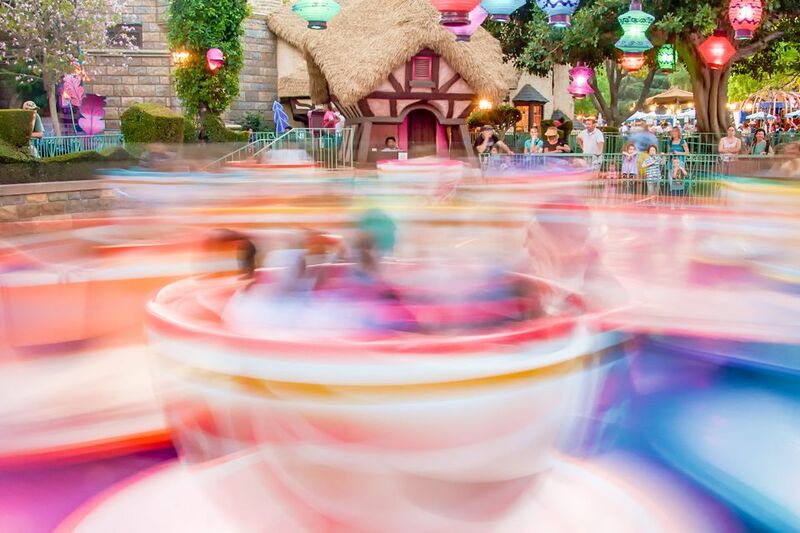 The spinning cups may be the most iconic ride in all of Disneyland. It takes its theme from the chaotic "unbirthday" sequence from the animated movie Alice in Wonderland. The ride recreates the Mad Hatter and March Hare's chaotic tea party. It's a crazy contraption to describe, but here goes: Start with 18 pastel-colored teacups. Put six of them on each of three turntables. Then put those turntables on top of one larger one. The result is dizzying, to say the least. The teacups are a ride where you can create your own fun. Riders in each teacup control how fast they spin. We polled 158 of our readers to find out what they think about the teacups. 82% of them said it's a must-do or ride it if you have time. Location: Mad Tea Party is in Fantasyland. Seating: The ride vehicle (as you probably already know) is shaped like a teacup. Riders sit on benches facing the spinner in the center. Each one will hold up to five average-sized adults, but it's more comfortable with three. Accessibility: ECVs and wheelchairs should enter through the exit. You have to transfer into the ride vehicle. Everyone worries about the nausea-inducing effects of all the motion, but few people know that the riders can control it. For a less dizzying ride, just don't spin. Your favorite motion sickness remedy may still be a good idea if you're sensitive. For great, blurry spinning pictures, try to get your shutter to stay open as long as you can and brace your camera on something to keep it steady. Or for fun pics of a cup stuffed full of friends, walk toward the Dumbo ride and on the left, you'll find a cup custom-made for photos. The Tea Party is beautiful at night. You may have seen tips that say the purple teacup spins the fastest. Or that it's the orange cup with diamond shapes on it. It's a myth, according to the website Yesterland, especially since the speed was dialed down in 2005. Tea Party is the only version worldwide that has no roof. It closes when it rains because the water makes the turntables slip and they stop spinning. If you're an adult, a good way to NOT have fun on the teacups is to get on it with a bunch of mischevious teenagers. The next thing you know, they'll be spinning the cup like crazy, leaving you feeling like a human centrifuge and on the verge of becoming a "puke-a-saurus." Mad Tea Party is one of the original Disneyland attractions that were in the park on opening day in 1955. If you were at Disneyland before 2004, you may wonder if you're getting weak and can't make the cups spin as much as before. You're right, but it's not your fault. They were tightened on purpose, for safety's sake. If you have seen pictures of a golden teacup on this ride, it was installed for the fiftieth-anniversary celebration and removed at the end of it. Every Disney theme park in the world has a Mad Tea Party ride. Is It Different than the Mad Tea Party in Florida? The ride itself is similar, but the setting for the California version is much more magical, under shady trees and brightly colored paper lanterns.